For the first in our new series of Fuller Center for Housing volunteer profiles, we’re introducing you to Mary Ann Turner-DeJesus, the director of human resources for the Abernathy MacGregor Group in New York City. She’s not our first profile because she’s so different from everyone else but because she’s the prototypical volunteer, sharing the values and beliefs of so many other Fuller Center supporters. She’s consistent, dedicated, earnest, faithful and determined to see that her work and donations truly make a difference and are not mere handouts that have little lasting effect. How did you get started with The Fuller Center for Housing? I started with Habitat in 1995. Obviously, after The Fuller Center was created, a lot of long-term volunteers like myself and friends were like, ‘OK, what’s going on with The Fuller Center? Let’s look into this.’ We joined up for the first time with the first Legacy Build in Lanett (2009). We just wanted to see what it was like. It was just such a wonderful feeling. … It was a feeling that we liked, very grass-roots. It was what we’d remembered when we’d met on one of the Carter builds. With Lanett being so close to where we’d met — we were in a build at LaGrange, Ga. — we were like, ‘Let’s give it a try and see what it’s like.’ We just had the best time and we decided that of course we’re going to stick with doing this with The Fuller Center because it’s just a wonderful organization and the families we worked with were wonderful. The crew leaders and house and block leaders were all just so wonderful. It was just such a great experience that I’ve now done the three Legacy Builds. Also, last year, in March, I went on a Global Builders trip to Haiti. That was my first time going on my own where I knew I wouldn’t have anyone else that I knew like I’d had on the other builds. How do your work colleagues feel about your volunteer efforts? Tell us about your January meeting with The Fuller Center’s Dianne Fuller, co-founder Linda Fuller and her husband, Paul Degelmann, in New York? I visited with Dianne when she was in New York recently, and I was quite surprised when Linda and Paul were with her. I’ve met them both before and spoken to them but not to the point where I had an hour of unexpected time talking to the three of them and another person who’d been in a meeting with them earlier. I was just so excited to be sitting with and spending an hour talking to Linda Fuller, who is one of my heroes. It was just an amazing and unexpected treat that day. I came in to work afterward and everybody saw me so excited. During that conversation, I was explaining to her that what she and Millard did to save their marriage and reaffirm their dedication to Christ — I know it’s changed many lives and put many people in homes — but it’s given me such opportunities and friendships and experiences that I wouldn’t have had otherwise. So I guess I was a little excited talking about places I’d been because of them. Was that your first time meeting Linda Fuller? The first Legacy Build, I spoke to Linda. We actually sat together at breakfast one morning. We were at the hotel near the job site, and she just happened to sit with me. We talked for about 10 minutes. It’s just amazing to me that this woman who has met leaders of the world, who is one of the most influential people that I can think of on the planet, as well as Millard, and she was worried about how her speech had gone over the night before. She was just an everyday person. It was amazing to me how humble and dedicated they are. I don’t know that the average person after helping that many people wouldn’t be like, ‘OK, I’m done.’ As she and I were talking about different builds, she remembered everything. Every build seemed to matter to her. Maybe she doesn’t remember exact names, but she had stories from every build. I don’t know that I can remember from my line of work something that I did two years ago. I might not even remember meeting people. I’m in human resources; it’s just something I do every day. It mattered to her. It filled me with such inspiration that people at work were like, ‘You are in such a good mood.’ I even made my Facebook status say something about how great it is to start the day by talking to someone who inspires you. In a contentious election season, what’s it like volunteering with The Fuller Center for Housing, which has supporters all across the political spectrum? I term myself a moderate-to-conservative Republican. I’m not extremely right-wing but I skew more toward conservative. I’m on builds with people who know presidents. … Even though I have friends on the trips who are all over the political spectrum, they do find something different. I, personally, being more conservative, like the idea that you’re helping people make their lives but not with a handout but a hand up. You know where your money’s going, and I’m a big believer in deciding where your money’s going and what you’re going to support and not just throwing another government program at something. … For me, I just find it a wonderful way for me to help in a way that I know is actually helping. To me, this isn’t charity. It’s being part of a community. Why should people volunteer with The Fuller Center for Housing? It’s a wonderful opportunity to serve, first of all, for people who just want to have an experience where they’re helping others. And especially that it’s helping people better their lives. They’re not just giving something to someone. You’re helping them to improve their lives. Also, I guess the idea is that everyone is just so kind and caring, you’re not going to have a bad time. You’re probably gonna come away wanting to do it again, as I have over the years. I know I always look for the next Legacy Build, and it’s on my calendar as soon as I hear the date as a trip that I know I’ll do. And I would like to do another Global Builders trip at some point. You meet people who really care about others. It’s a very simple experience where you just get to spend a week caring about what really matters in life. You get away from your everyday life. … You just come away with such a good feeling. You know you’ve helped someone, but you inevitably are the one who’s been helped more because your heart’s been opened and you focus on what’s really important in life. What I’ve really loved over the years is meeting partner families and hearing that they’re still involved. I’ve met so many people who don’t view it as, ‘Now my house is done and now I’m done with your organization and I’ll just pay my bills.’ I’ve met so many families who pay it forward and just really appreciate it. (Watch this video about two Fuller Center homeowners who pay it forward.) I’ve really liked all the families that I’ve worked with on the Legacy Builds. And in Haiti, I didn’t speak Creole, but we had translators and got to work alongside the families and get to know them a little bit. But I’ve really liked all the families. At this last build in Minden, one day I was feeling a little under the weather in the morning. And the house I was on was the super crew from Orlando (led by house captain A.J. Jewell) so we were far ahead. We just had little things to do. So they said, ‘If you’re not feeling well, why don’t you sit down for a little bit?’ So I sat with the homeowner (Shanika Harris), and she just kinda told me her life story and how much she appreciated the opportunity, just watching the tears welling up in her eyes as she was talking about how grateful she was for this opportunity, I really like to see people who appreciate this because it’s such a blessing and a great opportunity for them to change their lives around. It doesn’t matter what their life was like before, they now have a safe, warm house. And their children have safe rooms where they can have friends over and study and not have distractions that you have if you’re in a really rundown place. So I’ve had some really good conversations with those families, and that left me feeling even better about packing up and doing a long road trip with Toolie (Mary Ann’s friend and ardent Fuller Center supporter Karen Warkentien) or getting on a plane and meeting up with her and other friends for the week. 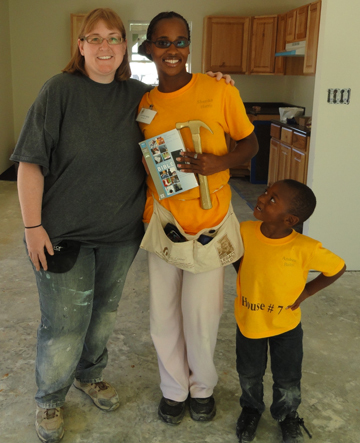 Learn how you can join the ranks of Fuller Center for Housing volunteers!